Have you watched all the seasons of Naruto and remember all the tracks by heart? The Naruto Music pack adds a small selection of music taken from Naruto Shippuden and Boruto and transferred to Minecraft Bedrock Edition. 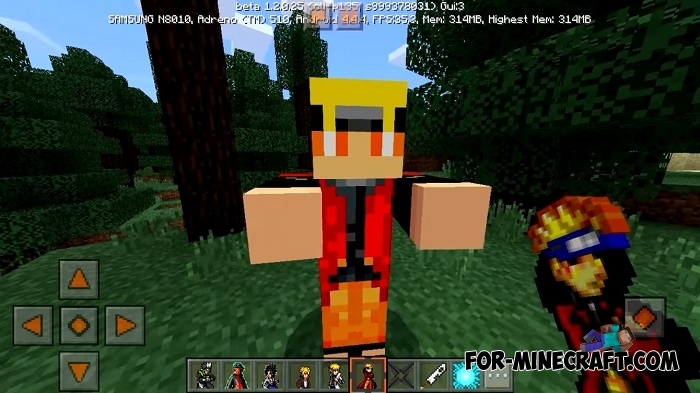 It will be better if you also install Naruto & Boruto addon adding the main characters, creatures and some items as well as the Naruto Texture pack changing the world around into the world of Naruto. New music will be played in all dimensions (visit the End at least). Use a jukebox and new records to play familiar sounds in your home. How to install the Naruto Music pack? Naruto & Boruto addon or Minecraft PE 1.1/1.2The fourth war of shinobi is over, the next generation of Shinobi has appeared. Meet the new hokage Naruto and his talented son Boruto..